"Being able to give back to the Military and their families is our entire reason for hosting this event," Aubrye Foote and Courtney Vera, FaveParenting Co-Founders. FaveParenting is hosting its Inaugural “A Day of Thanks & Giving” event on November 19, 2017 at The Garland Hotel in North Hollywood, CA. Celebrities, military, brands and families will come together to honor our military and first responders. Attendees are asked to bring diapers, unwrapped toys or new clothes to donate to the military families. 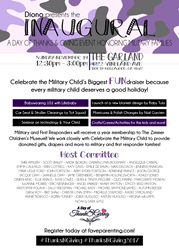 Celebrate the Military Child is the charitable partner of FaveParenting and will deliver the items directly to those military families in need. In addition, the event educates families on brands such as Diono, Ju-Ju-Be, Lillebaby, KidsEmbrace, Baby Tula, Joovy, and more, along with speaking topics on Babywearing 101 and Technology and Your Child. Attendees will receive Ju-Ju-Be gift bags filled with items from event sponsors. HOST COMMITTEE: Shiri Appleby, Scott Bailey, Nadia Bjorlin, Darren Lynn Bousman, Angelique Cabral, Emma Caulfield, Scott Clifton, Erin Cottrell, Katy Davis, Emilie de Ravin, Nikki Deloach, Jennifer Finnigan, Mark Leslie Ford, Abby Ryder Fortson, John Fortson, Adrienne Frantz, Jason George, Jacque Gray, Shanelle Gray, Jamie Greenberg, Benjamin Hollingsworth, Ashley Jones, Ginifer King, Ellie Knaus, Katie Lowes, Sean Maguire, Gilles Marini, Marguerite Moreau, Julianne Morris, Eric Nenninger, Angel Parker, Khary Payton, Kristoffer Polaha, Sally Pressman, Michael Rady, Michael Raymond-James, Autumn Reeser, Drew Roy, Brit Shaw, Christie Lynn Smith, Michelle Stafford, KaDee Strickland, Annie Tedesco, Robin Tunney, Kaitlin Riley Vilasuso, Jordi Vilasuso, Virginia Williams, and Noah Wyle. Sponsor Booths see the latest products and engage with Diono, Ju-Ju-Be, Lillebaby, KidsEmbrace, Baby Tula, Joovy, My Travel Tray, Happy Our, KIND, Greater Ink, spbang and more. All attendees will have the opportunity to socialize, enjoy refreshments and connect with participating brands as well as leave with a Ju-ju-be gift bag. FaveParenting has partnered with Celebrate the Military Child, asking attendees to bring a donation of diapers, new clothes or unwrapped toys in exchange for an additional raffle ticket for amazing giveaways.